Earlier in the summer, the Seattle music and arts community was shocked when it was announced that a beloved music venue, The Showbox – which since 1939 has hosted acts from Duke Ellington to Pearl Jam – was slated to be demolished. Onni Group, a multinational development firm, bought the theater and planned to turn the building into a 44-story luxury high rise. In response, a wave of indignation and fightback erupted in the city. The Showbox, on it’s own a cultural landmark in Seattle’s musical legacy, is emblematic of the trends that have been churning through the city in recent years. The city is every year becoming more and more a playground for the rich. The vast majority of housing construction in Seattle has been of luxury and “market-rate” apartments. Working-class Seattleites are being driven out of the city and/or onto the streets in record numbers. For the city’s musicians, artists and community activists, many of whom are themselves working people struggling for affordable housing, the prospect of losing the Showbox felt like the last straw. Far from a false choice between culture or housing, this was a question of whom Seattle as a city works for – people or profit. Already, downtown Seattle has a 26% vacancy rate, with rents too high for most to afford. Another 44 stories of luxury apartments would only add to it. Despite a slew of attacks by political pundits, tens of thousands of ordinary people in Seattle decided to stand up and fight. 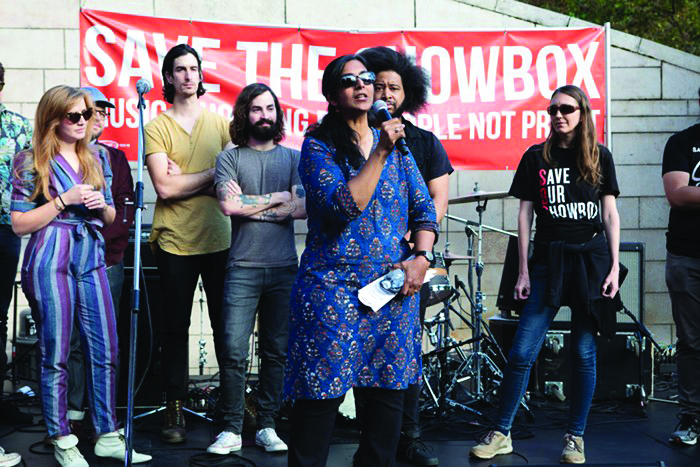 Soon afterward on August 6, Kshama Sawant, Seattle City councilmember and member of Socialist Alternative, introduced legislation to save the Showbox by including it in the Pike Place Market Historic District. This protected district was a direct result of mass struggle in the city in the 1970s. It allows small businesses and the community direct say over how buildings are used in their district, striking back against large developers’ predatory actions. Councilmember Sawant’s proposal had the impact it did only because of a determined and engaged resistance of working and ordinary people standing up and demanding that the Showbox be preserved for future generations. A local petition demanding the Showbox be saved has garnered over 100,000 signatures. Hundreds attended City Council meetings in August, spilling out of council chambers and filling City Hall. It was a race against time; if Onni Group was able to process their legal paperwork before the legislation passed, they could go ahead with their development project. Predictably, the first response of the majority of the City Council was to fiercely reject the campaign’s demand. When they couldn’t stop it, they tried to roll out delays. Ultimately, however, the movement’s defiant stance of thousands won the day. On August 13, the #SavetheShowbox movement achieved what seemed impossible, forcing the City Council to pass the ordinance temporarily expanding the Pike Place Market Historic District in an 8-0 vote. This fight however is still far from over – out of necessity the ordinance will only protect the Showbox for 10 months. In fact, the owner of the Showbox building is already suing the city in a frivolous lawsuit indicative of all the obstacles working people face when they stand up and fight back. WeThe movement also will still need to go up against the might of the real estate corporation Onni and the political establishment, who will no doubt attempt to undermine our efforts over the next months. Despite the ways we have yet to go, this fight already contains rich lessons not only for continuing the Showbox struggle, but for the movement to make Seattle affordable and livable for all. To best arm ourselves in further struggles, it is vital we understand where the power we wielded to win this Showbox victory came from. Why were we able to win this ordinance in such a short time when the political forces arrayed against us were so strong? The answer lies foremost in the incredible scope and breadth of the movement we built, with hundreds coming to City Hall over and over, but also in our steadfast determination to accept nothing but saving the Showbox on our terms. It is commonplace to see politicians, political pundits, and know-it-all’s disapprovingly wagging fingers at those who they see as “unwilling to compromise.” But the August 13 victory proved the total opposite! It showed that our courage in sticking to our demands and pushing for our side until the end is exactly what makes the difference between victory or defeat. In this instance, the question was never how much of the Showbox we should save: the question before us was straightforward – will the Showbox be saved or not? Our movement did not back down in the face of powerful enemies like the Onni corporation. We know that big business is never going to be on our side. And therefore, our struggle was not misled by those who, in order to keep cozy relations with politicians, sacrifice the needs of the movement, make excuses for betrayals, or accept shady compromises and even defeat. To win, we have to build a movement that is not trying in vain to find “common ground” with a profit-maximizing billion-dollar company. Our city is becoming a space only the wealthy can afford, and our movement has had enough. The real needs of a thriving culture and music scene, and the needs of working and poor people overall, should be prioritized, not sacrificed for the greed of a few. By tapping into this, bringing literally tens of thousands behind our demands, and regularly packing City Hall, keeping fire under the establishments feet, we were able at breakneck speed to pass our #SaveTheShowbox ordinance! These lessons will be essential for us; we will face many struggles down the road as this system of capitalism continues to pit our needs directly against big business profits. As working people, our strength comes from our collective action. These lessons are not unique to Seattle. They apply everywhere working and poor people feel the heel of capitalism grinding down on them. Everywhere, the interests of the vast majority of those in our society is sublimated to the interests of the few super wealthy at the top. Across the country, and even across the world, the question of housing is sharpening to ever greater degrees. Developer greed knows no border, and neither does the human need for shelter. Capitalism will always put the prospect of further profits over the needs of vast majority. In order to fight for our communities, our culture, and our lives we must also fight this predatory system. We must fight for a system in which working people are the ones with the final say over how our cities and communities are transformed and developed, a socialist system. If we are serious about winning this better world, we must take these lessons into future struggles against the powers that place profits over our communities, even when those obstacles facing us seem impossible to scale. When ordinary and working people band together in common struggle, anything is possible. Previous articleHow Do We Win the Fight Against the Right? Next articleLos incendios arrasan California. Un Estado en llamas.